A scene from Love Alone with Julia Gibson as Helen Warren and Jenny Wales as Dr. Becca Neal. When Dr. Becca Neal loses a patient after a routine procedure, she grieves much like the patient's family. 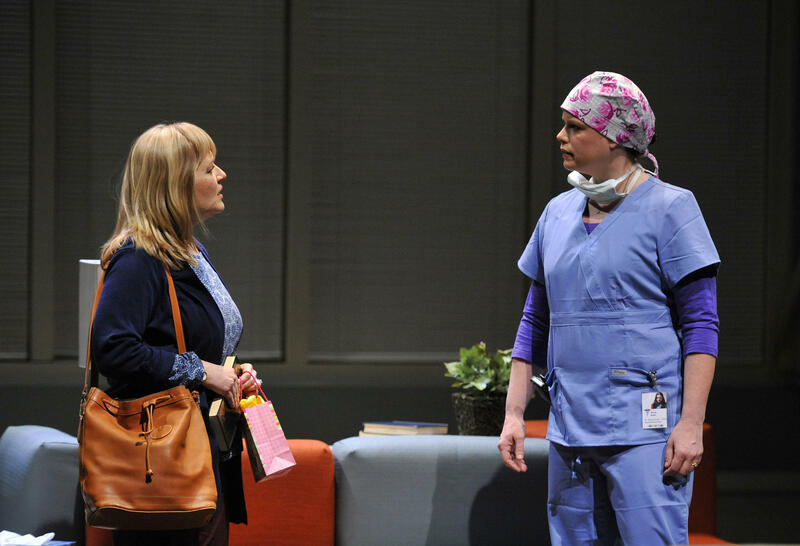 Neal is a character in Love Alone, a play by North Carolina native Deborah Salem Smith that shows the burden both patients and doctors bear after medical accidents. The play opens at UNC’s Paul Green Theatre tonight and runs through March 16. Host Frank Stasio talks with director Vivienne Benesch, UNC anesthesiologist Dr. Ty Bullard and actors Jenny Wales, Derrick L. Ivey and Patrick McHugh.